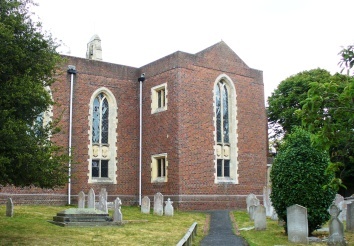 This dates from 1934-35, after being rebuilt once already in 1824, with a C14 window retained from the first church. 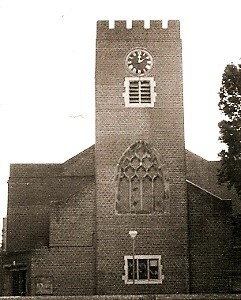 The present church is the third on the site; the previous one dated from 1824-26 and there was a mediaeval predecessor. Quite a lot is known of this, thanks to fragments re-used in the second church and found during the 1934 rebuilding, and several drawings, e g that in the Burrell Collection (1791). A study based on these (see 1) suggested the oldest part dated from c1110, including a south doorway, and there was a late C12 south chapel, which had an arch with stiff leaf capitals. The chancel was mostly C14, possibly with some older walls, as there was a round-headed north window, including an east window of reticulated tracery and a cusped tomb-recess inside. 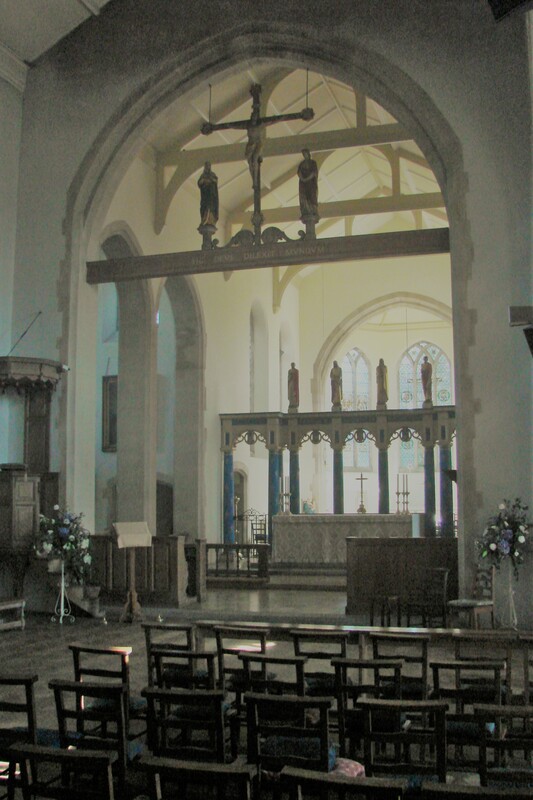 In the C15 the nave was remodelled with a new chancel arch and aisles. There is some disagreement about the size of the arcades for Horsfield (II p133) states the north one had two bays and the south one three, whereas according to Maitland each had four (1). Horsfield was almost certainly correct, particularly in his statement that there was one bay less to the north, as there was a boarded tower with a pyramid spire at the west end of the aisle; both were probably also C15. 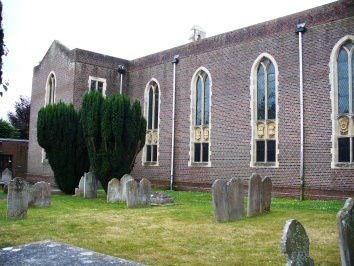 It was decided to replace this church on a new site within the churchyard in 1824 (WSRO Ep I/40/581) as it had become too small and was in poor condition. The architect of the new one was G Draper (ICBS) and it cost £3942 3s 5d (SRS 75 p142). Adelaide Tracy in 1851 (II p74) shows a flint gothic building with galleries, slightly protruding transepts with high gables and an undersized west tower with tall pinnacles, but lacking a chancel. Within two years of completion in 1826 it was said to be defectively built (WSRO Ep I/41/28). W White added an apsidal chancel in 1888-89 (WSRO Ep I/40/4522) and removed the re-used C14 east window of the first church, which had been rescued at the instigation of Edmund Cartwright (GM 1834 part 1 p597), who completed Dallaway’s History and is buried in the churchyard. White’s chancel included a new chancel arch and was intended as the first stage of a complete rebuilding, but because of a lack of funds this was only taken further in 1931, using a new design by W H R Blacking (CDG Aug 1934 p374), which was built in 1934-35. Except for Draper’s tower, which was re-cased and into which the C14 former east window was set, reconstruction was total. 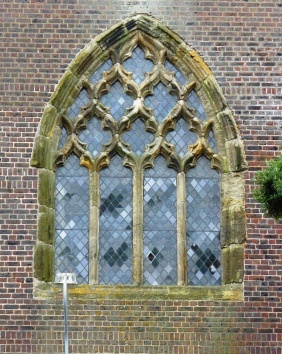 The material throughout is brick with stone dressings in a simplified gothic and there are galleries behind the blank centre panels of the long side windows. The tower now has battlements and the original design of 1931 shows a small turret on top (CCC file). Because the high altar is placed at the east end of the nave, what appears from outside to be the chancel is in effect a Lady Chapel with a three-sided apse. Blacking’s interior could hardly be simpler, but the colourful fittings (see below) save it from appearing bleak and the plan shows considerable ingenuity. In the nave, the aisles are behind plain arches with moulded heads that extend the full height of the building because of the galleries. These have C17-style balustraded fronts, and there are low-pitched white painted trussed roofs. 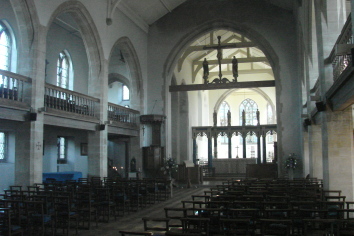 The altar, placed behind a cross-arch at the east end of the nave beyond the galleries, is flanked by two tall narrow arches leading to the transepts. Though their proportions are varied, the differences are not visually disturbing. The effect created, of a central altar, is unusual for the date. Ironically, Blacking’s church was in 1977 threatened with the same fate as its two predecessors (WSRO Par 127/4/21). 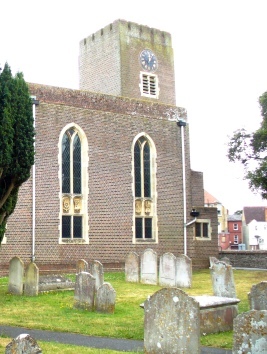 Problems of structure and size (the church was now thought too large) were cited, though the problems were overcome and the church is now the centre of a lively parish. Altar screen, Stations of the Cross and rood: By C Webb (ibid), like Blacking a pupil of Sir J N Comper. The pillared screen dates from 1950-51 and, unusually, the Rood is in the arch before the altar (VCH 5(2) p198). Font: C19 with elaborate ogees, angels and shafting. 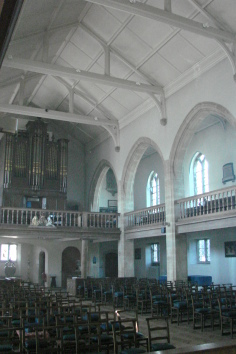 Another plain tub-font, disused in 1908 and said to be early (A K Walker p36), was given to St James, Littlehampton. Glass: The only glass in the church is in the east chapel and except for one south window dated 1902 has been ‘pickled’, i e the figures have been removed from their backgrounds and set in plain glass. It is probable that some at least of this glass is that known to have been provided for White’s eastern part by Ward and Hughes (www.stainedglassrecords.org retrieved on 11/3/2013). Memorials: (Galleries) These predate the present church and have been reset here. None is of artistic significance. Royal Arms: (On front of west gallery) Carved, late Hanoverian, probably of George IV, King when the church was rebuilt in 1824. My thanks to Richard Standing for the photographs of the exterior.